For patching small areas of lawn you can use a pump sprayer as a sprinkler to help keep the seed moist to aid germination. One of the major issues people have planting grass seed is keeping the grass seed moist. If the seed dries out it will germinate slowly or even die so it's important to lightly water the newly seeded area multiple times a day. On hot, sunny days it can be as much as 4 or more times a day. At the same time, applying too much water can cause problems. The seed can become waterlogged and die, the water can wash the seed away or push it too deep into the soil and the water can cool the soil slowing down germinate just to name a few. If you have an automatic sprinkler system it's easy to program it to program it to run multiple times a day for a short cycle. 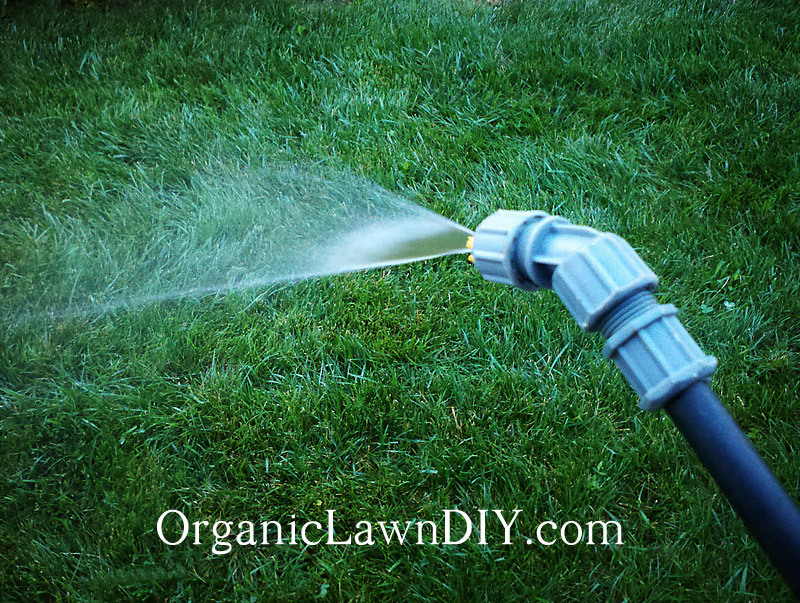 I don't and over the years I've been trying different ways to keep the seed moist while the new grass germinates because lugging the hose out to the farthest areas is a real pain since it takes about as much time to get the hose out and roll it back up as it does to water the lawn. I don't know why I didn't think of this earlier but this year when I overseeded a few areas that were damaged in the storm last fall I've been using my Smith 2 Gallon Pump Sprayer. The Smith sprayer has a clip that will hold the wand in place as well as a switch to keep the water flowing. 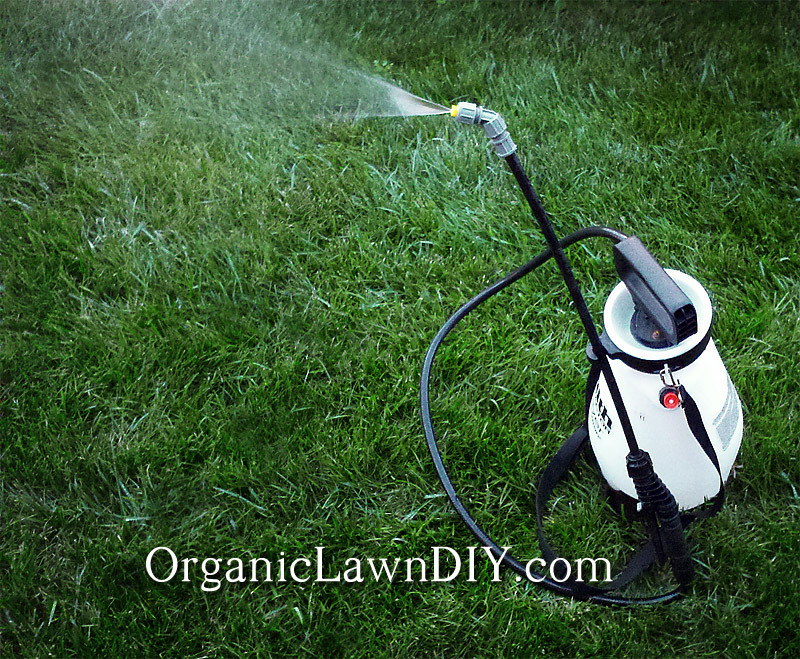 Normally I'll just walk along slowly spraying the lawn a few times a day to keep the top portion of the soil where the seed is moist but other times I'll just set it up, flip the switch to keep the sprayer going. Checking it every few minutes to pump it up, reposition or refill it. I will still drag out the hose out at least once every other day (usually once a day). This just makes it easier to keep the seed moist in between hose watering. About 2 gallons per 100 sq ft multiple times a day seems to be the right amount for my soil and climate. 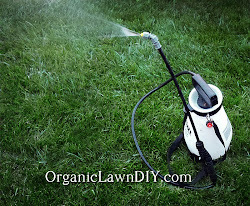 Not the most practical way to water a large lawn but for small sections, patching bald spots, watering new transplants or syringing plants during the summer the pump sprayer as a sprinkler works well and is cheaper than installing a dedicated sprinkler system for that purpose. I know :) But it works. Obviously not something you'd want to use for a large area but it has it's uses like patching small areas of lawn. I even used it to water a new plant. The advice I got was to run a garden hose on the lowest setting possible until I provided 2 gallons of water. I just set up the sprayer and went out to pump it a few times.